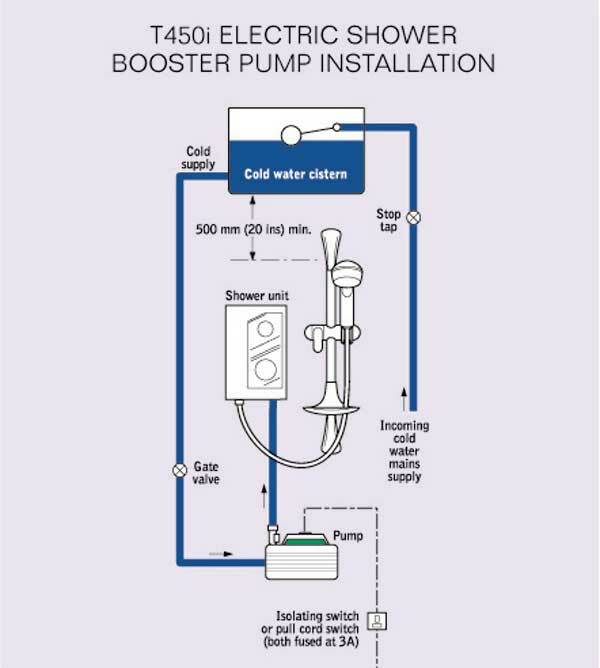 To ensure correct operation, the pump must be connected to a cistern fed supply of cold water. The pump MUST NEVER be connected to the mains fed water supply. The cold water cistern must always be above the pump to ensure priming of the unit and at least 500mm above the sprayhead. If used with a combination cylinder the cold cistern must have a capacity of at least 114 litres to avoid starvation of water to the pump. 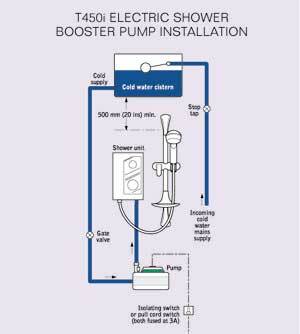 Cold water supplies to the pump must be dedicated and separate from any other supplies. T450i has two flexible connections with 15mm push-in fittings. The wiring must be connected to the switch without the use of a plug or socket outlet. The supply cable selected for installation must conform to the relevant table in the current I.E.E. regulations. The minimum size will be 1mm2. To enhance` electrical safety a 30mA RCD (Residual Current Device) should be installed in all UK electric and pumped shower circuits. This may be part of the consumer unit or a separate unit.